Early in another of our country's wars, long before Americans started flying the flag from their sport utility vehicles and draping it from highway overpasses, Old Glory blazed forth on the nation's envelopes. The first months of the American Civil War saw a surge of patriotic sentiment in North and South, and Americans - and American enterprise - displayed this patriotism in highly visible ways. There were rallies and oratory, sewing circles stitching silk flags for volunteer regiments, and a nation of letter writers snatching up stationary engraved with the flag, with nationalist slogans and iconography. Knowing my interest in this period in history, my Great Aunt Margie once sent to me a padded envelope containing Civil War memorabilia she had found while sorting through her mother's desk in her rent controlled Manhattan apartment. Inside were a pair of Union officer's uniform buttons that had been fashioned into earrings (along with a cryptic note that they had belonged to an unnamed Union Officer who tunneled to freedom out of Libby Prison in 1863) and 24 patriotic envelopes dating with but a single exception - more on that later - from the first months of the war. All are different, and none were ever mailed. Although collectors of philately place a higher premium on patriotic covers that were franked and used, I have treasured these uncirculated ones ever since. I offer a selection of them here, along with something of their place in history and speculation about their origins in our family's effects. "The printed envelope came into use in America in 1840 and was first used for advertising or satirical purposes. In the 1850s to 1860s 'corner cards,' with printing applied in the upper left-hand side of the front of the envelope, were common. By the onset of the Civil War, printed envelopes were already in use as a propaganda medium. Lithography was the main mode of printing used for envelopes, especially for colored designs. Printed envelopes were sold either as a single item or with matching paper"
Engravers all over the North capitalized on the patriotic sentiment of the early months of the war. They copied each other's designs and often copyrighted their creations. Some, like the cartoon condemning Jeff Davis to the gallows at left, were monochrome engravings. A few were fine examples of the printer's art. One of the best and most popular engravers of patriotic covers was Charles Magnus, a German immigrant working at 12 Frankfort St., New York. My collection contains a single example of his work, the cover at right depicting an eagle with shield and the US Treasury building: an odd choice of civic monument, perhaps, but in the first month of the war it one of the most impregnable buildings in the Capitol, and plans were made to fortify it as a stronghold. Most of the patriotic covers in my family collection with identified engravers were printed in Philadelphia: many by publisher James Magee of 316 Chestnut Street. If I were to guess, I'd say that one of the women in our family is a likely candidate for the original collector, perhaps my Gr-gr-great grandmother Catherine Ann Nisbet Olmsted, whose son William Nisbet Olmsted served a month in the defense of Washington in the Spring of 1861 with the 7th New York Regiment. She certainly lived in Philadelphia during that time, and it was her grand-daughter's desk which contained them prior to their coming to me. In any case, someone clearly kept them the way some people hoard commemorative state quarters today, not intending to mail them but to to keep them for posterity. Subject matter varies in these early war patriotics. I particularly like the Liberty Bell cover that appears below (a Magee) with its petition to Congress on the reverse side calling for the abolition of slavery. baggy pants at right, marching to Washington via Baltimore, alludes to the riot that greeted the first volunteer regiments passing through Maryland in April, 1861 that resulted in the deaths of 4 soldiers of the 6th Massachusetts and numerous citizens of Baltimore. I love General Winfield Scott "Old Fuss 'n Feathers", caricatured as a fearsome bulldog, defending the rib roast of Washington from the cowering cur of Jeff Davis. See my earlier post on anthropomorphizing the Civil War. Under these satirical images was real concern for the security of the Capital, which in the first month of the War was extremely vulnerable to seizure by rebellious Virginia on one side and hostile Maryland on the other. By the end of May, the North had its first martyr. Elmer Elsworth, a friend on Lincoln's whose pre-war militia demonstrations set off the "Zouave" uniform craze, was the commander of the 11th NY "Fire Zouaves". After entering a hotel in Alexandria, Virginia to pull down a confederate flag, Ellsworth was killed by the owner, who was in turn slain by a member of the 11th. The nation mourned, and Ellsworth's image adorned many patriotic covers until Bull Run, when the North had other more dramatic losses to address. Other individuals were the subject of patriotic covers. One in my family collection depicts John Charles Fremont, "The Pathfinder." Fremont was a famous personality with Presidential ambitions - in 1856 he was the Republicans party's first presidential nominee - and was appointed a Major General by Lincoln in May of 1861 and assigned command of the Department of the West. Fremont did not have an auspicious Civil War career, and this undated cover with his image is likely from the very early stages of the war when the nation placed its hopes in untested and politically appointed commanders. Images of Union and "Death to Traitors" sloganeering are well represented in patriotic covers. 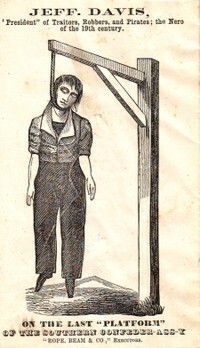 However, in our family collection there is also the image at left, grotesque and racist by any measure, showing a subhuman slave on all fours, clad in prison stripes and holding a whip and asking in dialect for Jeff Davis. The same family that saved the image of the Liberty Bell with its abolitionist petition also purchased and saved this image, probably considered comic by the standards of the day but very disturbing to modern viewers. 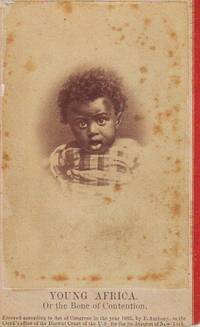 The card at right, not a patriotic cover but captioned "Young Africa Or the Bone of Contention", was printed in Philadelphia and is also in our family archives. Even abolitionists had feet of clay when it came to racial equality. There is only one patriotic cover among the 24 in this collection that clearly dates from later than 1861, and the subject matter is likewise unique. The US Sanitary Commission was an extraordinary volunteer achievement that came into being in 1861 to bring aid and comfort to Union soldiers. It staffed a broad network of hospitals that cut the disease rate in half by the close of the war and engaged thousands of volunteers, especially women who broke down societal taboos against female nurses and raised substantial resources to further the work of the Commission. 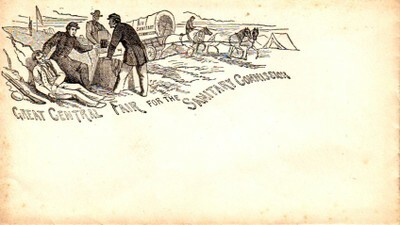 One of the key fund raising mechanisms was holding a Sanitary Fair, and in June of 1864 the Great Central Fair of the Sanitary Commission was held in Philadelphia. The monochrome patriotic cover, below, commemorating that huge charity event seems a fitting subject for late in the war, when the flags of '61 were tattered from shot and shell and the nation had endured hundreds of thousands of casualties. There is a different form of patriotism in this final envelope than the rest - the 19th-century equivalent of "support the troops." It reflects a nation that knew the terrible price of war and recognized the need for bandages as well as bunting to see the thing done at last. Yet there is also, even in this somber image, the possibility for reconciliation. I wonder whether the lighter uniformed sergeant depicted on the cover could be a southern casualty, an enemy combatant no longer but an injured fellow countryman, at least when the cruel war was over. Interesting piece of information, it is nice to read something that is worthy.